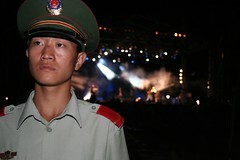 This weekend, for the second time this summer, music once again filled Chaoyang Park for the Beijing Pop Festival. 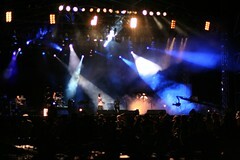 Headlining was former Stones Roses front-man Ian Brown and hip hop artist Common. It was an excallent way to spend a Saturday evening and a great way to finish the Summer. Click here to view the pics. I have recently been listening to the Last.FM radio service powered by Audioscrobbler which is really cool. This offers free high-quality personalized radio that you can listen to online. You need to have an account to use the service. After picking a username and signing up, you should install the Audioscrobbler Plugin for your media player (iTunes, Winamp etc..) which sends the name of every song you play on your computer to Last.fm. Over time, this list of songs grows larger and larger – you can see your personal listening charts on your userpage. Last.fm automatically finds people with a similar taste, and generates music recommendations for you. Based on these recommendations, you can then listen to a personalised radio station tailored towards your musical taste. To do this download the Last.fm Player. In fact, you don’t need the Audioscrobbler plugin if you have installed the player – you can create a custom radio station based on the artists you like on the Radio page – but you will get better recommendations over time if you use it. There are dozens of other entertaining and useful aspects of Last.fm, but you’ll have to sign up and explore them for yourself. To get an idea of how this works view my profile by clicking here. If any of you sign up let me know the address of your profile page by posting it in the comments section. As an iPod owner with a shed-load of music, I am always on the lookout for good software for automatically tagging (i.e. adding the track, artist, album name etc.) to my music so that I can find it when browsing through my tunes on the iPod. Recently I came across this tool Musicbrainz which so far I am very impressed with. Adding tags to your music is tedious to say the least and this tool makes it and quick and as painless as any I have yet discovered, and *bonus* – it’s free. Mac users get the best solution from this setup with a plugin for iTunes called ieatBrainz(!) (download here). Windows users can use the excellent Music Brainz tagger software. Yesterday I began playing around with an interesting community service called Audioscrobbler. Essentially it is a system that monitors the music that you listen to on your computer and then recommends new artists based on the listening habits of other users on the network. Geeky but actually pretty cool. After installing a software plugin, your computer sends the name of every song you play to the Audioscrobbler Server. With this information, the system then builds you a ‘Musical Profile’, from which it then calculates which people are most similar to you, based on shared musical taste, so you can take a look at what your peers are listening to. 1. Register to get your own username and profile. 2. Download a plugin for your music player, and enter your login details. The great thing about this system is that it is designed to be completely unobtrusive – once you have set it up it will work silently in the background monitoring the songs you listen to and sending the stats to the website. To get a better idea of how it all works you can see my statistics by clicking here. I have also installed a special plugin on my blog that will display the last 10 songs I have played (look in the sidebar on the right).